North Stradbroke Island, or Straddie to the locals. is located in Morton Bay and easily accessed from Brisbane. The first time we went I could believe we were only an hour from the central city yet already a world away. I can see why people return here for their summer holidays year after year and we’ve made our own annual winter ritual of visiting. 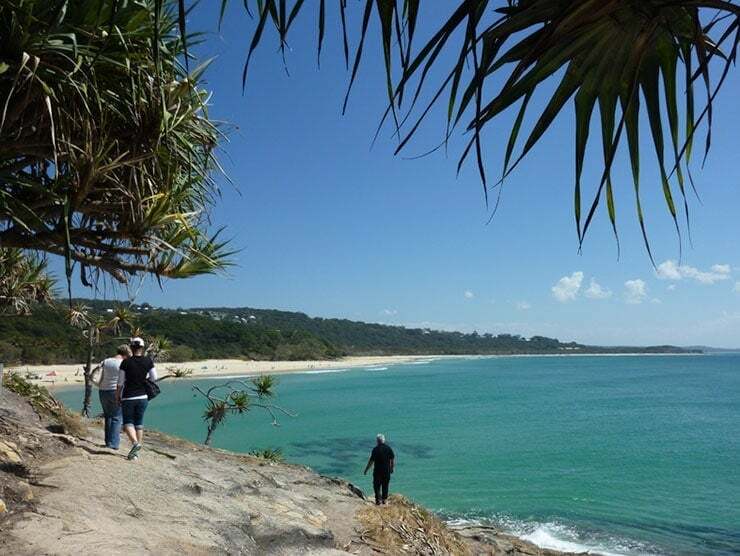 Morton Bay is full of marine life and Stradbroke Island is a great vantage point to see it all from. For whales you’ll need to be here during the winter migration season. It runs from July to October and this is the time of year we always plan our visits and have seen good numbers of whales on each trip. They are a little way out so you’ll mostly see the spouts as the whales surface but if you watch for a while you’ll also likely observe fins, tail slaps and the occassional massive splash as they breach. While the Point Lookout is the best spot to see them from because of its elevation you’ll be able to see them all the way along the gorge walk and we’ve even spotted them from down on the beach. Closer in to shore you’ll also see dolphins. Sometimes we’ll see a group of 3-8 but other times you see a much larger pod all moving together. They particularly seem to like the surf beaches where we’ve often seen them playing on the waves and have spoken to surfers over the years out there who look across to see they were sharing their wave with a dolphin or two. How incredible would that be. 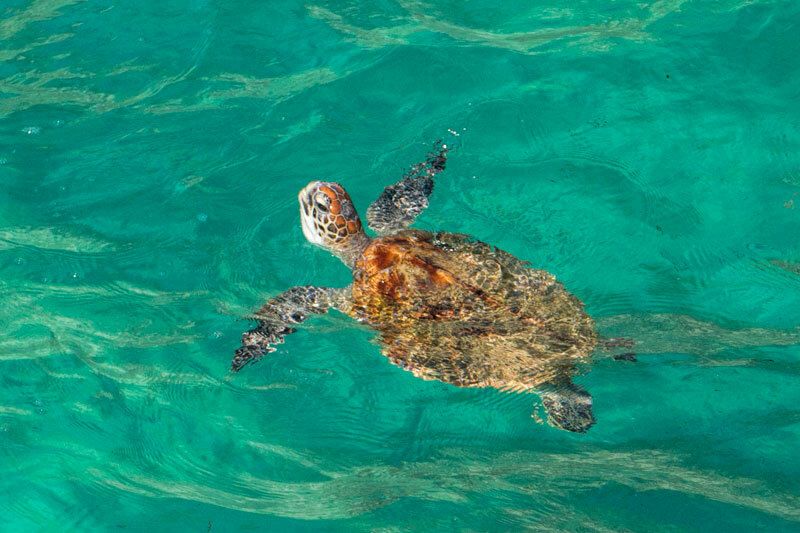 Another marine animal that you see on Morton Bay and have a very high chance of seeing on North Stradbroke Island is the sea turtle. They are often seen off the rocks but the best place is along the gorge and we’ve always seen them here feeding, they seem to come in after the blue blubber jellyfish. Other wildlife you might spot in the waters around the island are dugong and seals. If you have a 4-wheel-drive and the skills & confidence to take it off-road on the sand then main beach at North Stradbroke is an excellent choice. 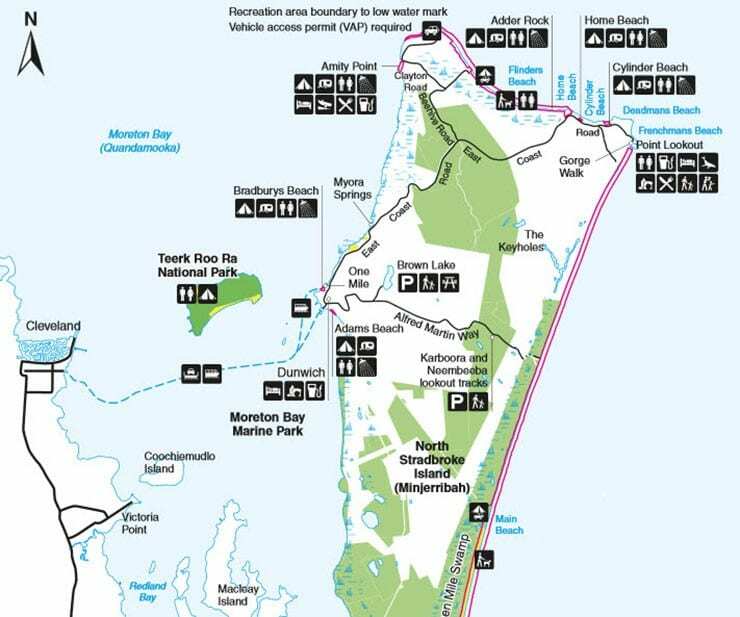 You’ll find these beaches just as beautiful and rugged but with far less traffic than the more popular Bribie and Fraser Island tracks. The walkway is well formed and easy walking but it’s very open so make sure you bring your hat and sunscreen. Take the chance to walk down onto the rocks and look around, glance out to the horizon to spot whale spouts and have a good look in the gorge, it’s a likely spot for sea turtles. They seem to herd the schools of blue jellyfish up there then eat them. Facing directly north Cylinder Beach is a gorgeous beach for fishing, swimming and enjoying the massive sandy beach. There’s a camping ground here and cafe’s nearby. You can walk here easily by taking the stairs down to the beach just before the gorge walk or you can walk out to the road and join the bus at the stop close by. We do love seeing Australian wildlife in a natural setting. 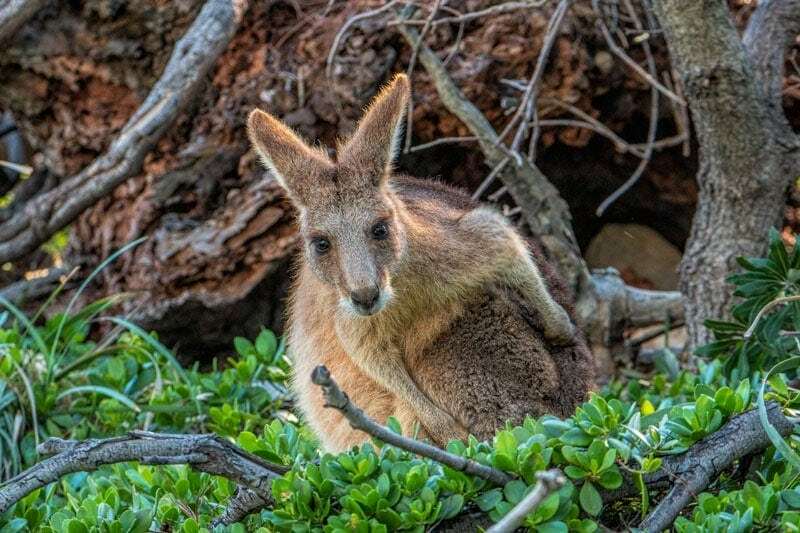 You might recall that we’ve shared our favourite spot to take visitors to see kangaroos on the Gold Coast previously, Stradbroke Island is our top spot to take them in Brisbane. We’ve never been disappointed in our sightings here. Well maybe its just me but a day of sand, salt air and sunshine really feels like a holiday when you round it out with an ice cream. Oceanic Gelato is conveniently positioned at the end of the Point Lookout walkway. There are tables and chairs outside or take your treat over to road to the beach. There’s are so many trays bursting with creamy indulgent flavours that it really is hard to choose. A single day here can feel like a holiday but an overnight stay is going to be even better. There are options for all tastes from luxury beach houses to beach-side camping. If you’re planning to stay a night or two on the island a well rated option is the Samarinda for it’s sought after location near popular beaches, the gorge walk and cafes. It has its own pool and great views. So I can’t surf. Well I can’t stand up while surfing and I think lying on the board all day is frowned on in some circles. 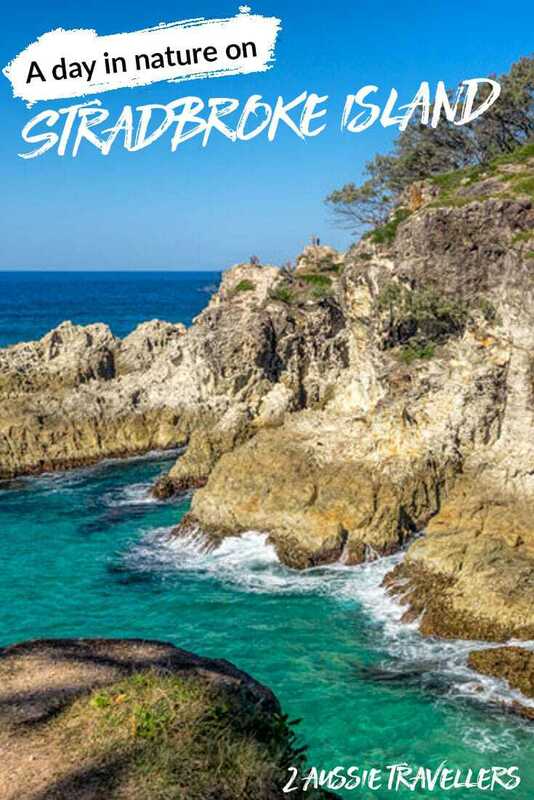 If you can surf however, or you just like to crash around on the waves on a body board then you’ll love Straddie. 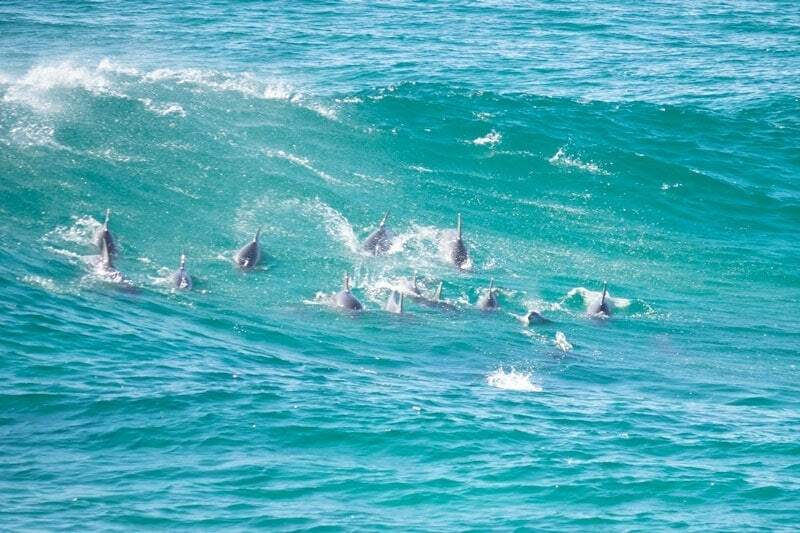 There’s a multitude of good surf spots on the island that are easy to get to and you might even find yourself being joined by a pod of dolphins who are pretty impressive surfers themselves. As the name would suggest the ‘Straddie Pub’ is beachside so you can enjoy a cold brew while taking in that stunning view for free from the Wave Bar and Beer Garden. You just have to see this view to believe it because I was too busy cooling off with a icy drink and forgot to take the photo. Just a heads up though, it’s not our pick for lunch. There’s miles of clean white sand on the island, some are more popular that others but you can always find a patch of sand to call your own for the day. Pack up a picnic, pack and the family and head out for a day of sun and fabulous beach-side memories. Myora springs is a freshwater spring and unique wetland area near Dunwich. The spring has run for thousands of years and is a sacred gathering place for the Quandomooka people. If you walk through here you might spot the water mouse which is now a vulnerable species and also the endangered swamp orchid. It’s a popular swimming hole but if you do swim be careful when you enter and exit the water carefully to prevent erosion of the banks. The natural perched lake is brown, or perhaps more attractively described as tea coloured, from the tannin in the leaves that constantly fall into the lake from the surrounding teatrees. It’s a beautiful swimming spot and the walk in is both beautiful and a good chance to spot some of the local wildlife and birds. There are toilet and picnic facilities here if you plan to stay a while. The bus doesn’t go out this way but if you don’t have a vehicle it’s about 4km from Dunwich and you can either bring your bike on the ferry or hire one when you arrive. If you don’t have a private boat, then you have three main choices for getting to North Stradbroke Island. You can take your own car across via the vehicle ferry from Toondah Harbour in Cleveland. The ferry takes around 45 minutes to make the crossing. Make your way across then use the local bus, walk or cycle around the island. There are two ways to do this, you can go as a walk-on passenger on the vehicle ferry or the faster and more comfortably option we prefer is to take the Stradbroke Flyer. It only takes 25 minutes to get across and costs $20 per person on the Flyer which makes it an affordable and relaxed day out of the city, we’ve also seen dolphins and turtles from the both on some of our trips so it’s worth watching out for them. Both the Flyer and car ferry leave from Toondah Harbour in Cleveland and land at Dunwich on the west of the island. The bus meets the ferry and the ferry meets the bus so you won’t have to wait long and it’ll cost you $10 for a daily bus pass. The bus goes to Point Lookout and Amity Point on the island but you can’t reach the lakes or southern end by bus. 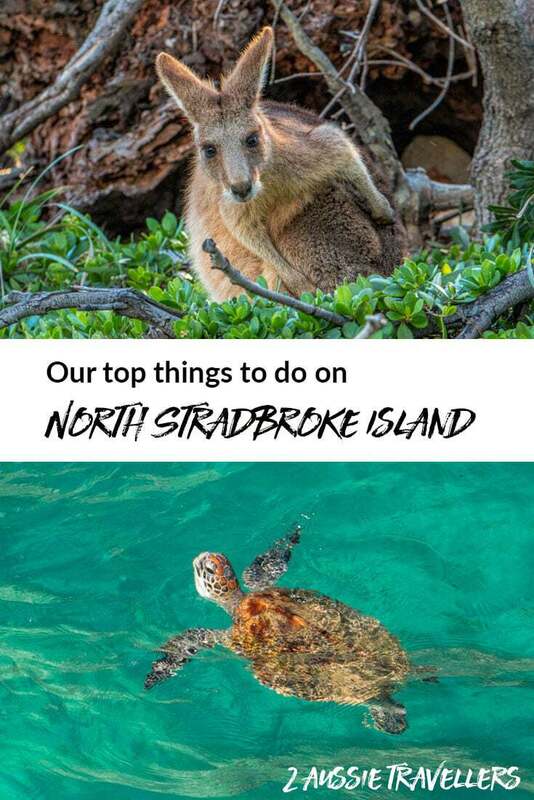 If you’re in Brisbane on holiday without a vehicle there is a another really good option and that is the North Stradbroke day tour from Brisbane . It’s a really highly rated small group tour that picks up from the central city and goes to many of the highlights listed in this article including Myora Springs and the Brown lake that aren’t as easily reached by the public bus. 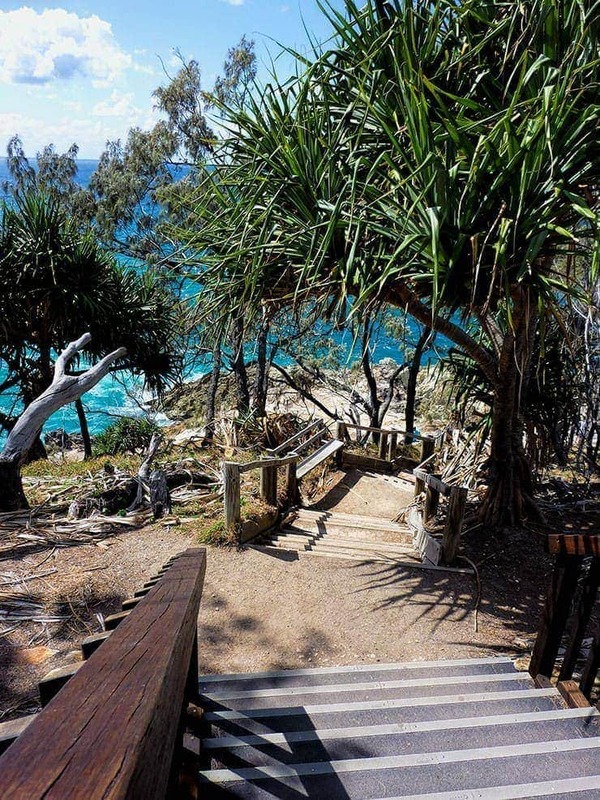 North Stradbroke Island is a relaxed spot for a day away from the city. Have you been there? Do you have a favourite local escape in your home town? 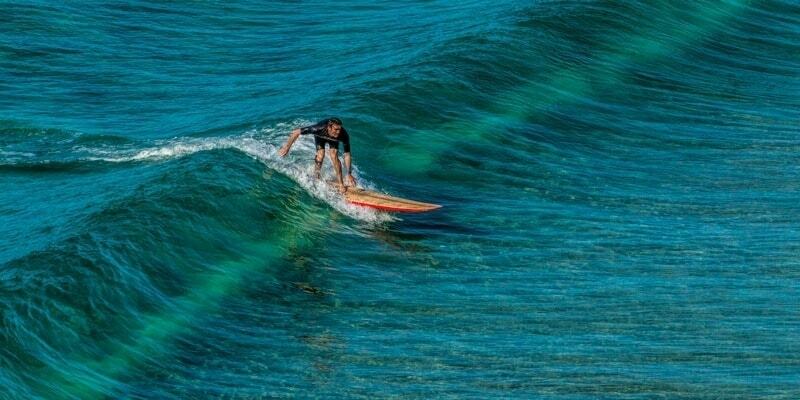 Will definitely be giving that a try next time we get across to Straddie. Scooters on Straddie! So much fun, lovely people, beautiful Island. You will not regret giving this a go! We’re looking forward to giving it a try in a couple of weeks Jacqui – it looks like a great new option. Did Fraser two years ago for New Years. We love Fraser too, there are so many gorgeous islands off Queensland. Have a great holiday! Hi Kate, thanks for stopping by the blog. Your kids love the outdoors and being active so I think they’d love Straddie if you’re down this way.